Hi, a couple of months ago I have hosted my email account with a domain in Thunderbird. I tried to synchronize my internet connection in this email program but, I encountered an error i.e., Thunderbird failed to connect to Exchange Server. Can anyone guide me on what am I suppose to do now? Most of the Thunderbird users face different errors while working on it. One such error is Thunderbird Failed to Connect to Exchange Server with ExQuilla. This kind of server error is not easy to understand for a normal user who a nontechnical person. Previously, it was difficult to fix this issue for a normal person. But, nowadays it can resolve by connecting Thunderbird with MS Exchange server. For establishing this connection, one needs to have an Add-on named as ExQuilla’s. This will help users in connecting with Thunderbird to Exchange server version 2010/2007. So, users have to install this addon by providing required server details. 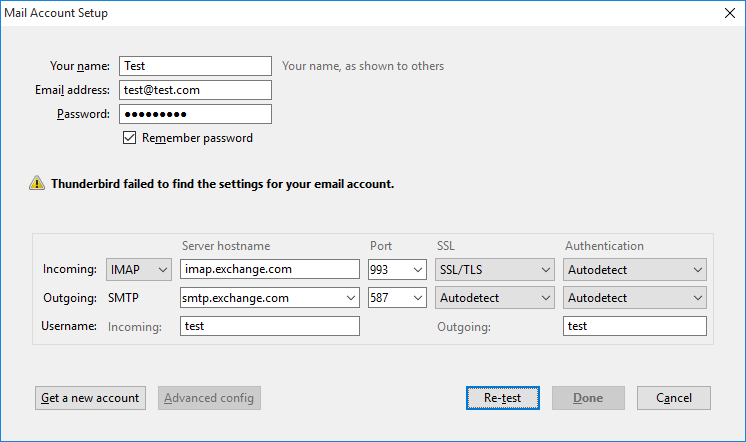 In the following section, we describe the method to install this Add-on with steps to setup Microsoft Exchange. Know How to Setup Account? Another best solution to this is to perform this without Thunderbird so the time that user spends on Thunderbird will be eliminated. To perform like this user have to Convert Thunderbird MBOX to PST. Now import this obtained .pst files to Exchange Server with help of PST to Exchange Migration tool. This is really relevant if the users have Thunderbird email file on their local hard disk. The above content says the problem faced by the normal user that is Thunderbird Failed to Connect to Exchange Server. So here we have discussed the solution as by the manual procedures. The method used here is a wide process so the third party tool is discussed in the above automated solution. This works really fast to move MBOX files to Exchange without Thunderbird.